Waffles come out best with a reliable waffle iron. I’m not a huge fan of blog advertising, and I was not paid in any way to mention this product, but when I find something I like or works well, it seems worthwhile to share. So here goes: I love my waffle iron . This waffle recipe is just like my donuts recipe, and you can play with this recipe to lighten the waffle or make it spicy or sweet. And it goes well with a variety of toppings. What are your favorite waffle toppings? Blend all the ingredients together with a fork or whisk. Warm up your waffle iron. Place the dry ingredients in a mixing bowl, and blend with a whisk. Add 1/4 cup of the batter, maybe less or more depending on your waffle iron, and close the lid. When the waffle is ready, take it out, place it on a plate, and then add your favorite topping! These waffles are sweet enough to eat by themselves as well – I’ve grabbed one to eat it on the run a few times. Seal left-over waffles and store in the refrigerator for a few days, or seal and freeze for a month or so. My son is allergic to eggs but I would like to make waffles for him. What can I use to replace eggs in the recipe? I’ve used applesauce in place of eggs. That might work pretty well in pancakes. Kathy, thanks for adding this post :). But that said, I would give the recipe a try by just modifying it a bit, based on some recipes I have found (see below). I found a couple of recipes that don’t use egg, so it could very well work with the almond flour. I love your website – so helpful! I was wondering if you have ever tried separating the whites and beating them before adding to the wet ingredients. This is the way I used to make waffles – do you think it would work for this recipe? Laura, yes – I think it would work – the egg separation thing. JoAnne, I sometimes (when I remember) use a bit of olive oil in a mister, lightly on the surface. But I the waffle iron I have (in this post) doesn’t seem to need it. Your site is LOVELY. The pictures make me want to get in the kitchen and cook! I’ve recently been diagnosed with gluten intolerance and dairy problems that have probably been extent my whole life and are now showing up with skin problems. I’m excited to try some of these alternatives. How great to find a fellow grain-free blogger! It’s great to be acquainted with your site! JoAnne (above) tipped me off to your site! I’ll be checking back often! I’m finally getting around to writing my response about these. It was a perfect comfort breakfast – fluffy and eggy they way I like them. And I’ve had them many times since then. Even my husband who avoides my ‘special’ foods like the pleague likes them. I use half the amount of sweetener – I tried it with none, but it didn’t brown right. Last week I added coco powder and chocolate chips. Thanks again! I made this the other day, and really enjoyed it. I cut the recipe in half, left out the honey because I can never whisk it in with cold ingredients, and added 2 tablespoons of pureed pumpkin. I liked it better than the coconut waffles. Thanks! Hi Apsalar. Pumpkin! Good to know. I would have never thought to try that. Bummer. Maybe they’ll come back in a newer model, being that this model is so popular. I do avoid non-stick coatings on kitchenware, but this is one exception I make – I agree with you – it’s almost impossible to avoid non-stick with waffle makers. I have seen cast iron makers, but I can’t recommend any off-hand. Made this recipe again this morning, but has I had a very ripe banana, I mashed that in and skipped the honey. Tasted like fresh banana bread and made the house smell wonderful! We just finished our breakfast having these waffles. They are kid approved! One son said they were dry, but I’m guessing it’s because I don’t let him flood his waffle with maple syrup. They came out very brown, so maybe next time I won’t cook them as long. I was also thinking maybe I’ll add some melted coconut oil to the mix to see if it helps with moisture. Maybe I used too much almond flour. I’m not sure how to go about measuring it, and I may have packed in too much flour in the measuring cup. All in all, the waffles were a success! They are a bit dry, but I add stuff on top as well. Yes, try adding yogurt, milk, or oil. I added a few tablespoons of melted butter to mine and they were not dry at all! I love being able to eat some delicious waffles that my stomach approves! I added 1 tbsp of coconut oil, they turned out perfect! Awesome! Thank you so much for a wonderful recipe. 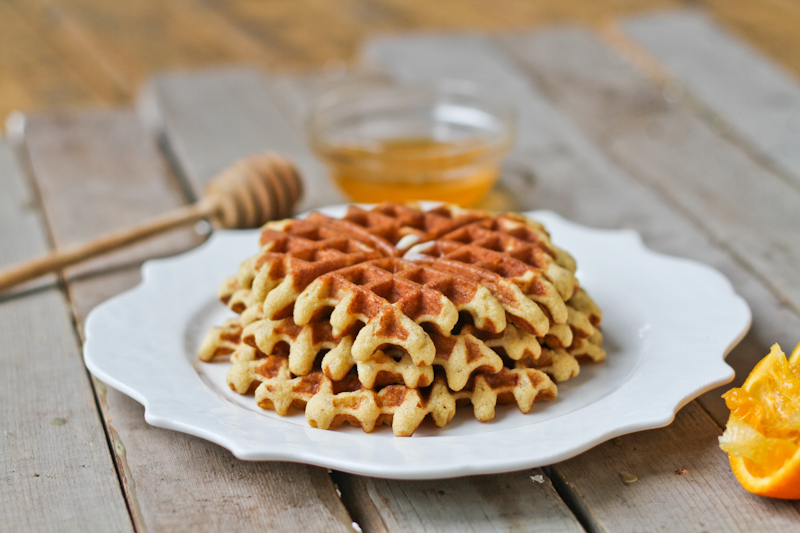 would you recommend your almond or coconut flour waffles? Are these crunchy? 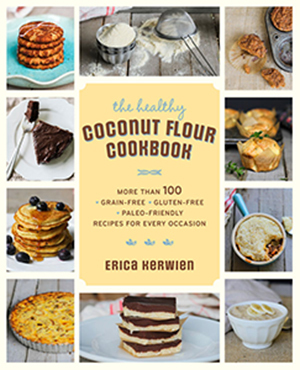 Would the coconut or almond flour be crunchier? I miss the crunchyness for the gluten ones. I have celiac disease and tried making these this morning and they were AWESOME! Hands down the best-tasting gluten-free waffles I’ve tried so far – thanks for the recipe, I will definitely make these again!! I just made these and they are amazing. Thank you so much for sharing your recipe. My boys like them with blueberries inside and blueberry syrup, which I make from heating up blueberry jelly. So yummy! yum. Great idea about warming up the jelly! Looks yummy. Are they crispy? not really. you could crisp them a bit in a toaster oven or toaster. Made these last night. I substituted a ripe banana for the honey. The kids are dipping them in syrup anyway! Very yummy. I reheated them under the broiler. Very nice. Great idea! the broiler 🙂 and love the banana sub. Followed the recipe exactly and these waffles were wonderful! We enjoyed them with our own home canned peaches…easy and delicious waffle recipe! Best almond flour waffles so far! I have tried many recipes and these are AWESOME!! Thanks so much for sharing this recipe! I love, love, love these waffles! I can’t even count the number of times I have made them. Thank you! Searched “best paleo waffles” to find this and boy was that accurate! I made it for my mom for mother’s day and it was enjoyed by the family. The whole kitchen smelled like roasted almonds and it was delicious. 🙂 I reviewed it on my blog. Okay, I tried this recipe, it was good but a little too eggy.Then I had an epiphany, why not try it with (DEB EL Just Whites) egg whites, and ta-da, no more eggy test. Still 100% eggs, but without the eggy taste and smell! Just a tip for someone who had issues with the eggy taste like I did. I’ve never heard this recipe to be eggy. You may need to adjust your flour measurement. So glad I found this recipe! After a round of Whole30 I wanted to continue eating healthy but also wanted waffles. This recipe meets that need. I add walnuts and shaved dark chocolate. These are the best, and a delicious way to use up the fresh eggs our hens lay. Curious what the purpose is in adding baking soda? There is no acid in the recipe for it to react with for leavening. Is the ingredient just for browning or did you mean to put baking powder? It seems like a leavening agent would be needed for this? Good question! The baking soda reacts with the honey or maple syrup in the recipe. I’m about to experiment to see if adding yogurt or additional acidic ingredients will make the waffles rise further. If you’re not following SCD, yes, go ahead and use gluten-free baking powder. I’ll update this once I test a few things.